EDITOR’S NOTE 03/27/14: Another one removed for copyright infringement. Sorry about that, folks! Our video for this week is the pre-credits sequence from “Big Jessie,” the episode of the Western series Cimarron Strip that first aired on February 8, 1968. Timothy and Donnelly Rhodes are a pair of outlaws on the run who are about to make life miserable for Marshal Jim Crown (Stuart Whitman). Rhodes, born and raised in Winnipeg, has been a Canadian and American television stalwart since the late 1950s. His most notable recent performance is probably that of Dr. Cottle in the Battlestar Galactica reboot. This entry was posted in Television and tagged battlestar galactica, big jessie, cimarron strip, donnelly rhodes, stuart whitman, timothy carey. Bookmark the permalink. 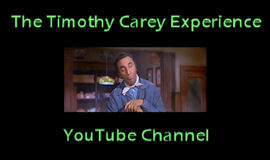 Big Jessie is my favorite episode of Cimarron Strip, and not only because of Timothy Carey. It has an exceptionally well-written script (by Daniel Mainwaring) and a great performance by Mariette Hartley. I was delighted to discover Ms. Hartley plays the title role! I wasn’t familiar with this series at all until I discovered this episode. It really should have gotten more recognition than it did, I think.